Good morning! 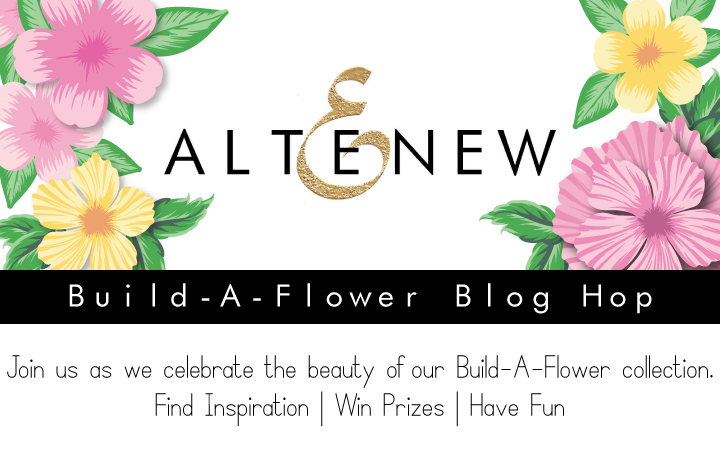 I am so excited to join Altenew to celebrate one year of their amazing Build-A-Flower collection! 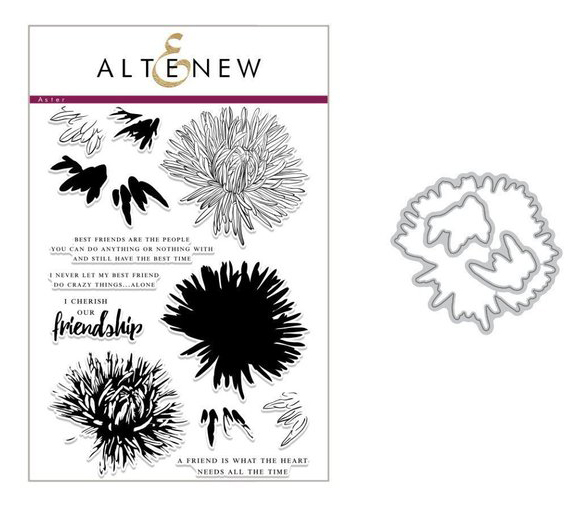 Each month Altenew releases a new flower stamp and die bundle and after a year there is a veritable garden of gorgeous florals to choose from! 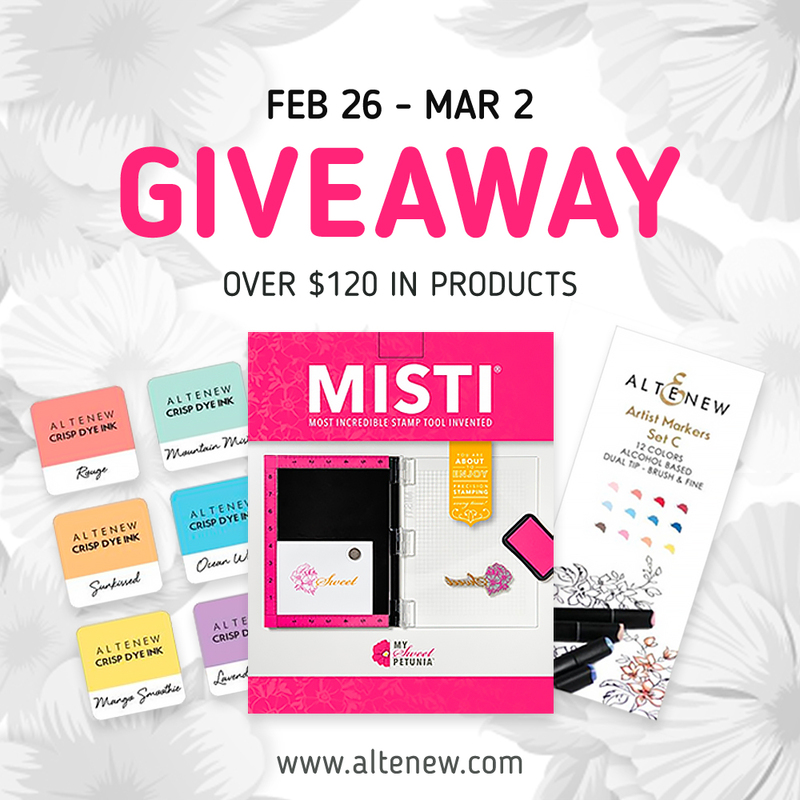 We are celebrating with a huge blog hop with tons of giveaways AND a chance to win a giant prize valued at over $120! All giveaway info can be found at the bottom of this post! 🙂 Today I chose to use the beautiful Build-A-Flower Aster set for my card! I started by stamping the aster outlines on watercolor paper with versamark and heat-embossed them with gold tinsel embossing powder. Then I used zig clean color real brush markers in wine red, geranium red, and pink on the center of the flowers and peach pink and light carmine on the outer petals. I blended the together with a damp paintbrush and added more layers of color to build dimension and depth in each flower. 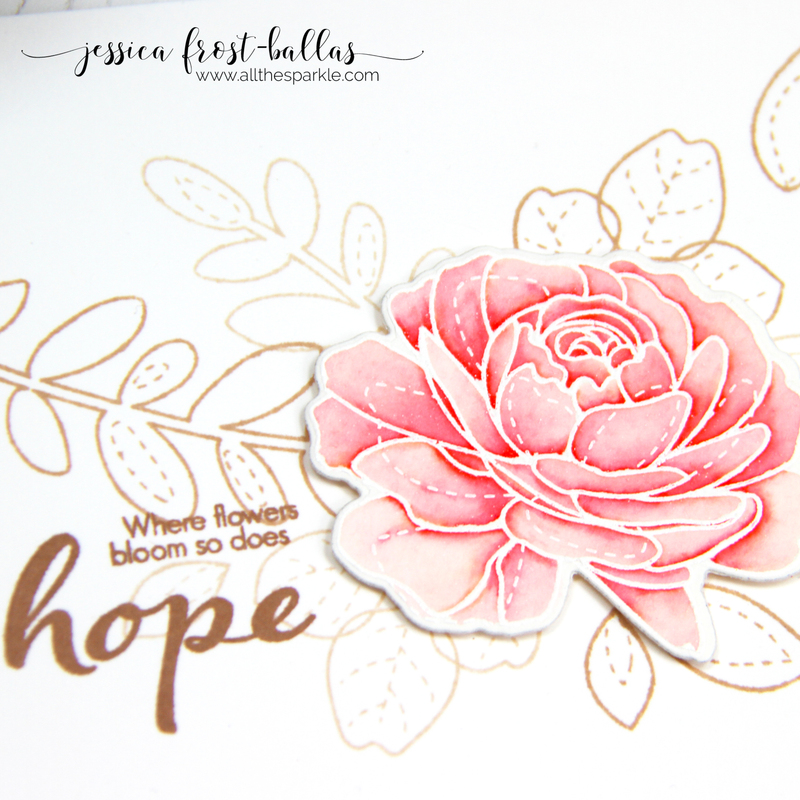 Once the flower was totally dry I die-cut it with the coordinating dies and then went over the die-cut border with a black zig marker. I didn’t want the white outline to show to keep the color palette to a stark gold and black with the bright pop of pink! I repeated the process with a second flower. 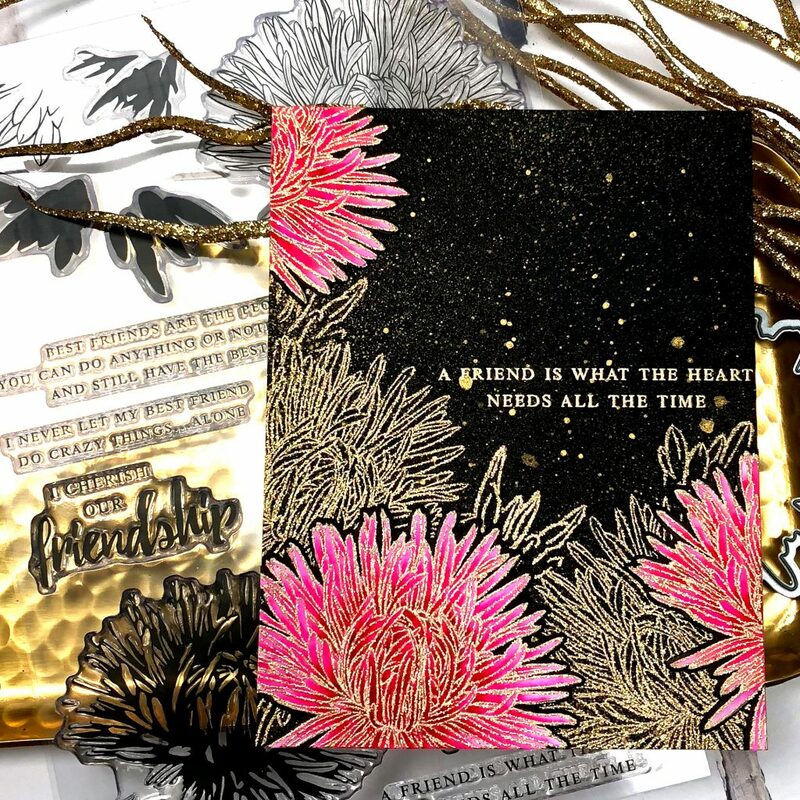 Next I stamped the outline of the flower and leaves onto a piece of black cardstock with versamark and heat-embossed it with the same gold tinsel embossing powder. I also stamped the sentiment and heat-embossed it with regular gold embossing powder. Then I spritzed the panel with gold shimmer spray and added larger flecks with a paintbrush. I let that dry for a few seconds and then blotted it off with a paper towel. Then I did it again but this time I let the spray dry completely on its own. This resulted in varying shades of gold on the background which gives the panel a little extra depth. Finally I arranged my flowers over the black and gold panel and popped them up with foam mounting tape. Unfortunately a little of the splatter got on my sentiment and it’s bright in the photo but when you actually hold the card in your hands you can read the sentiment with no problem. It doesn’t bother me but if you ever get splatter where you don’t want it you can either dull it down by blotting it with a paper towel or remove it with a few dabs of a barely damp paper towel. I feel like this particular card is appropriate for any season but you could easily use the same layout but with black, silver, and blues for a winter card, or gold, black and reds for an autumn card. Or you could do it on white with a rainbow of colors! 😉 Rainbows make everything better! 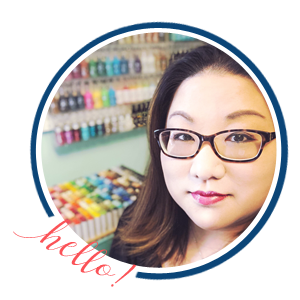 Thanks so much for stopping by and have a wonderful rest of the week!! The card is breathtaking against the black background. The colors are so vivid! Yes, this card, this flower is absolutely stunning. Beautiful work. Wow, this is such a great card. Love the background with the shimmer! I love the Build-a-Flower sets and your aster is one of my favs! Love your card. Magnificent, Jessica! I have to rethink that aster now. Oh my… so gorgeous! 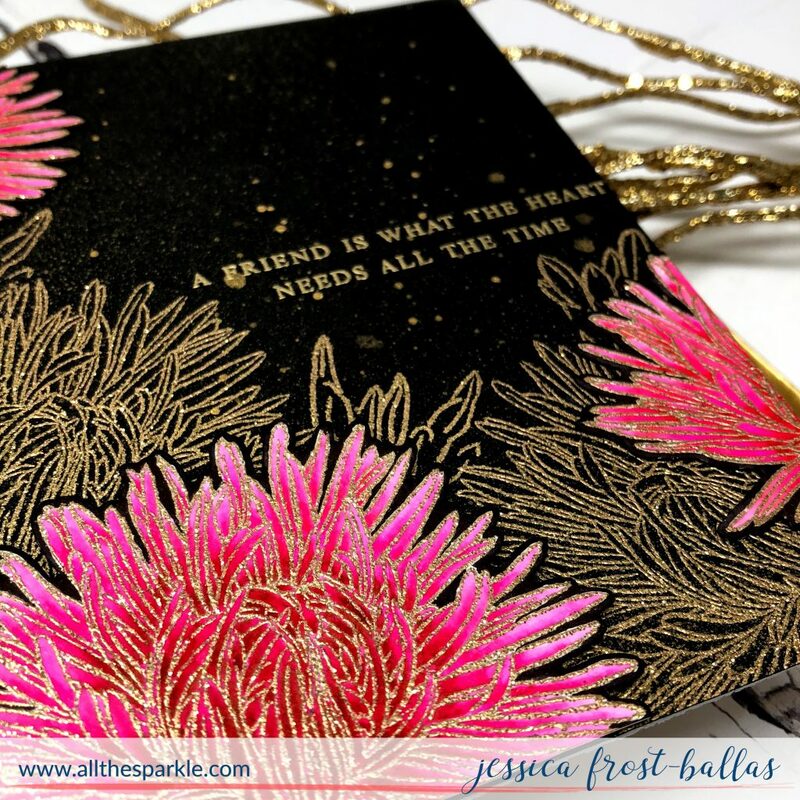 I love how you embossed in gold and that you only colored some of the flowers… so pretty! And the gold on black is so striking! I wouldn’t have thought the Zigs would show up on black… Thanks for inspiring! 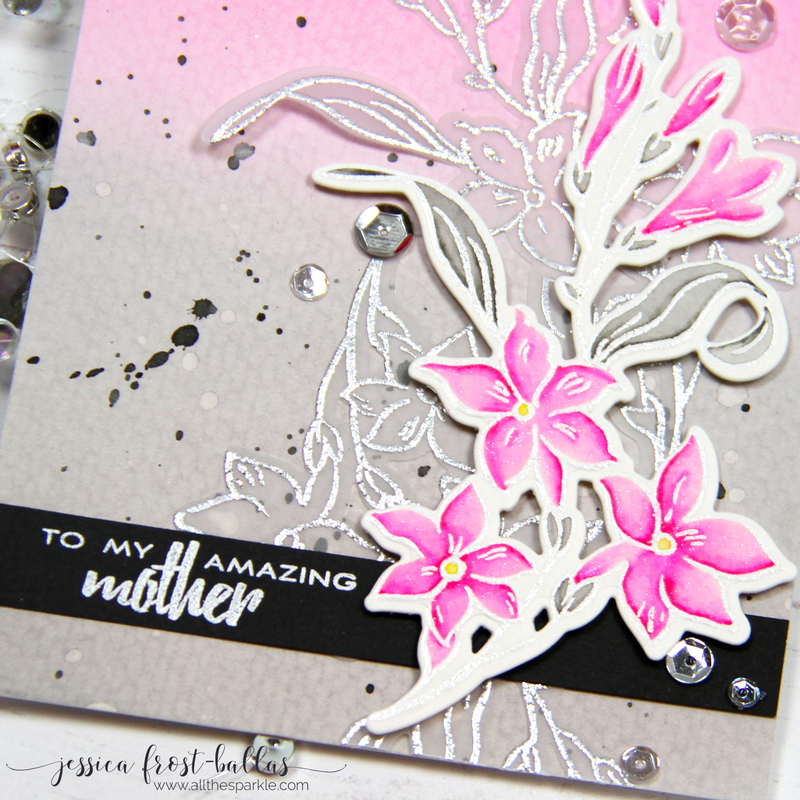 Wow, Jess, I hadn’t really looked at the Aster stamps till now & your card just blew me away! 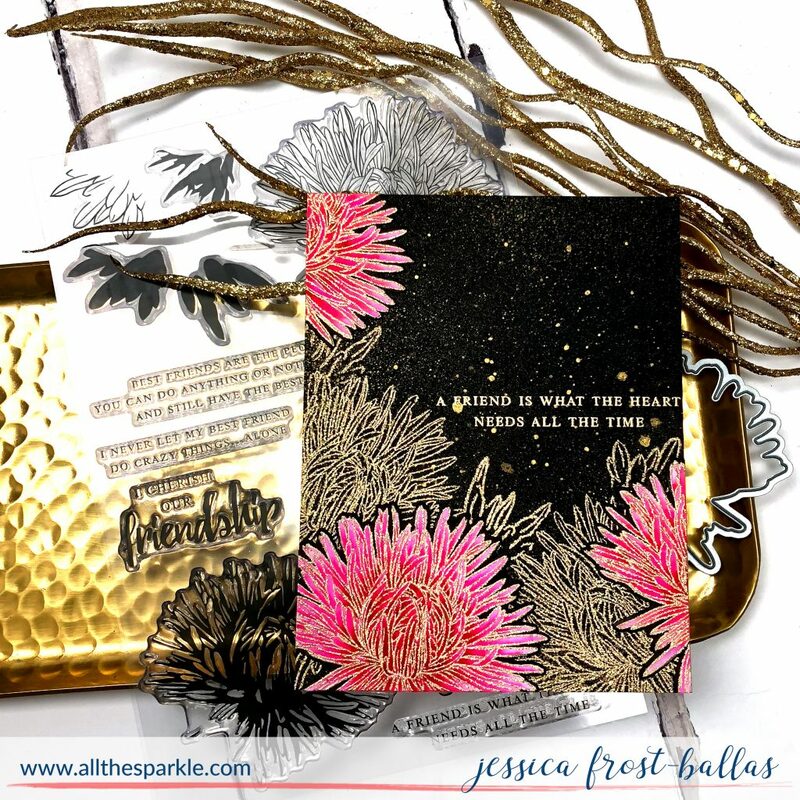 Love the gold embossing & gorgeous colors!! I need those stamps! 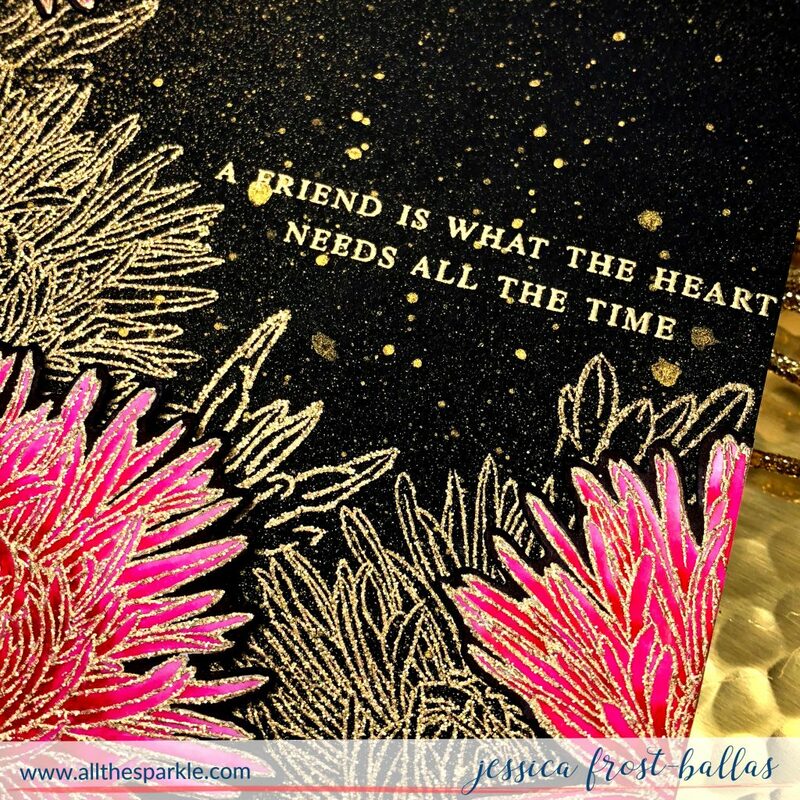 A gorgeous, dramatic card, Jess… with a wonderful message! Love the elegance of your black and gold with a pop of color card. Thanks for sharing. I like the gold embossing on the black cardstock. So vivid! Wow! How stunning is this card. I love how you’ve used the embossing powder and then coloured them in with thise awesome pens. They really stand out and are so pretty. Just Stunning , I love it! Lovely , elegant card! Thanks so much! Beautiful card. love how the colors pop. Love these flower builder sets! I just bought 2 of them!